I've seen several people (myself included) suggest that the best way to start in this game is always to put out 4 clansmen and upgrade technology for a decent income. This does seem like a solid opening, but I always wondered whether it's the only good opening, or, whether it's the best opening in many cases (particularly when no clansmen VP scoring is present). I've only recently (after 50+ games, almost all being solo) come to the conclusion that often it's not good to put out several clansmen. After several solo games experimenting with few workers, I've come to the conclusion that quite often it's not the best way to proceed, and for some clans it's actually suboptimal. TLDR; both a worker/clansmen and a production strategy seem feasible. For some clans, one is preferred over the other, while for other clans it's really dependent on: space availability, contracts, round vp, etc. The other day I played a solo and in the VP tiles the clansmen tile was absent. I don't exactly recall the VP tiles, but I think production areas was an early scoring tile, and meat and exports (or reversed) were in round 4-5. I picked MacKenzie (the whisky-clan) and put down 2 woodcutters relatively close to ports. I noticed a couple of money exports in the offer, and came up with a plan. I decided to use the exchange-port to exchange my 2 starting clansmen with 2 distilleries (to make whisky). I put down a field to go along with it, another distillery, and got a grain from the market (and I think I did something else as well, but can't recall). So my income in round 2 was 16 (pass) + 0 (workers) + 9 (for 3 whisky) = 25 coins, but I did have 3 whisky barrels. I sold 2 for 22, invested in some merchants, and put a 2nd field and my last distillery out (among other things, I think I also completed 1-2 contracts in the first 2 rounds that had money on them). From then on, for the rest of the game, my income was 16 (pass) + 12 (for 4 whisky) = 28 coins (but with 4 whisky barrels). I soon had an overflow of whisky (I actually ended the game with 8, cause I didn't have enough merchants to sell them all, plus the price soon got really low), so I looked for a few whisky contracts (wasn't actually that lucky there), sold a few, and made full use of the cellar (usually getting them out for +7 and once for +15). Throughout the game I focused massively on slaughtering cows/sheep, getting contracts with (preferably) a bit of a money bonus (or settlement bonus, which is in a sense also a small money bonus), and didn't care about settlements. I only had 4 settlement areas (only about 10-11 buildings at the end), and (interestingly) had played a game with 0 income from workers. Still, I never had cash issues because I could really play to MacKenzie's strength (whisky income + cellar). I played a few other games since, where clansmen VP was not present, or where clansmen VP was present late in the game, and again, a similar strategy of disregarding workers in favour of production buildings worked wonders. Currently, I'm thinking that whether or not clansmen are the best way to go depends on: 1) the clan, 2) the VP tiles. If the VP worker tile is in round 1 or 2, then putting out workers is definitely a good idea as it just gives you a bunch of extra poins. If it's not (or if it's later, in round 3-5), it might be best to follow the clan's special power. Cunningham (milk-clan) : Put out 4 cows asap. Workers are really not necessary. Focus on bread/whisky in stead (ignore cheese, until perhaps round 5). Campbell (production building discount) : This one also seems pretty straightforward. Their strength is to spam cheap production buildings. So setting up production as your main income seems most efficient. MacDonald (rowing clan) : This clan benefits from early worker scoring as they can put out all 8 workers in round 1. Workers are the way to go for them (possibly even 5-6 in the big loch in the center of the board), it seems. Fergusson (3 edge clansmen + 3 shipping). As they already start with 3 workers, it seems logical to invest in another one and upgrade technology. MacEwen (beer-clan) : Focus on a stable wheat income (or buy cheap from the market) and fulfill as many contracts at a steady pace. Clansmen income can be feasible or not. It seems they can go either way. Depends on the contracts available. Robertson (river delta reduction) : They can go either way. I currently prefer production heavy (rather than clansmen heavy), as those are more available at river deltas (especially slaughtering livestock and rebuilding is useful). But they can also cheaply spread out, put some cheap workers in deltas, and compete for settlements. Stewart (Market manipulation) : They benefit from producing more and being able to sell more. But having more money income makes them buy more on the market, so I can see it go either way. Buchanan (extra contracts) : They want to go for as many contracts as possible, so a production heavy strategy seems logical (also, it costs them less to get contracts near the end, so they won't need as much money, just the right goods), though perhaps the same can be achieved with a worker income, so it's not clear.. I think one of the reasons why production buildings are often better than workers is because of the VP tiles. - export contracts (equivalent, though early production income makes early contract fulfillment more likely). So the VP tiles favour a production setup, and I've noticed in my games that I tend to score more glory points (in-game VP) with the production strategy than with the worker strategy (unless worker VP is in round 1-2). Let's do a comparison of income effectiveness (assuming every spot costs 3, which for multiplayer is an overestimation, but for solo an underestimation). - 4 miners + upgrade = 4x13 + 10 = 62 (which is doable with a 55 start + 5 for contract + selling goods. This provides you with a solid income of 16 (pass) + 32 (for 4 upgraded miners) = 48. So --> 62 cost, 48 payout. - 2 woodcutters (18) + 2 cows (24) + 2 chees dairies (22) = 64 (still feasible with selling goods). Income is 16 + 8 = 24 + 2 cheese. Cheese is worth 10 at the start, so effectively it is 44. Not that much worse, especially if the price of cheese rises. And it saves you having to buy cheese for contracts. So 64 cost, 44 payout. - 2 woodcutters (18) + 1 field (21) + 2 bakeries (22) = 61. Income is 24 + 2 bread (also 44). So 61 cost for 44 payout. - 2 woodcutters (18) + 1 field (21) + 2 distilleries (26) = 65. Income is 24 + 2 whisky (worth 11, so 46. So 65 cost for 46 payout. - money needs to be spent with merchants. It's usually better to already have the right goods for a contract then to have to buy them. - 2 woodcutters + 1 field + 2 distilleries cost 65, but now give a starting payout of 52 (+6 for 2 whisky). (80%, compared to 77% for just 4 upgraded miners). - 2 woodcutters (18) + 4 cows (48) = 66 cost. Income is 16 + 8 + 32 (milk) = 56. An even better rate (85%). So for these 3 clans it just simply seems better to invest in production early (though round bonuses can matter). Also, keep in mind the final production round. A production strategy just scores 2 points extra. 4 upgraded miners is 48 money = 4 points. Production of 2 processed goods + 2 workers = 6 points (same for Cunningham). All in all, the game is far from straightforward. There are multiple ways to go about it. Even after 50+ games, I still learn new things! Love it! As a data scientist, I really like your post! Thanks, much appreciated! I'm a bit of a data scientist myself, though my area is more statistics, rather than economics. If it were the latter, I probably would have used ROI (return of investment) as someone pointed out to me . Excellent analysis. I spotted that the first 3 games I played I went worker-heavy early and didn't win. So, in the 4th I went against my instincts and went production heavy and won. I do think to do well at this game you have to really consider which is the better option for your setup. I still think money is better for most clans. Average cost of placement is about 2 I think (unless the KS tile with bonus for 5-6 placements is in game). Take for example clan campbell. Making two bread for example requires 1 grain and 2 bakeries costing 6 (3x placement) and 5+5+18 = 34 total for 2 bread extra income. Placing two extra miners and upgrading however is 10+10+2+2+10 = 34 total and makes you go from 12 to 32 income, ie a 20 increase. I chose this example as they have roughly equal costs, depending on how you value land. But 20 income is better than 2 bread usually I think. The bread can be sold for 20 but you diminish future revenue of your bread which you probably want to max. Most of all though it uses up your merchants, merchants provide good flexibility, you often want to sell off goods you aren't exporting soon to get more production going. Or you might want to benefit from cheap expansion bonus buys. Money income is just much more flexible and worthwhile than a similar 'money' income for goods. I rather have 20 money than 2 barrels of whiskey for example even though they can be sold for more because 1) it takes merchants 2) costs tempo which costs me turn order or gets me later to crucial contracts or spots on the map and 3) diminishes further value of getting that product. Basically getting a bunch of money and 1 production of a good is usually quite a bit better than less money and 2-3 production of that good. Too much production of a good right from the get go makes it really hard to unload it all because you tank the market price and can't find enough contracts to get rid of it usually. I think these clans that have great bonuses for producing just want to get woodcutters more than miners, in general most clans should prefer woodcutters imo. The only clan which doesn't want upgrade first turn is cunningham and maybe mackenzie. With mackenzie i feel that 4 woodcutters and 1 or 2 whisky while buying grain is usually better still. With cunningham you probably want 4 cows first, then 2 extra woodcutters. But 4 woodcuters first with 2-3 cows seems fine too and are about the same. Here is an overview of the Return on Investment of different production units if built in the 1st round and if built in the last round (taking into account that the last production phase is different such that milk is worth 1 VP=10 pounds etc.). I assumed the starting market price for the respective goods and an average hex cost of 2. The ROI of workers that are not upgraded is clearly below production units and upgraded workers have about the same ROI. In the last column you can see how the ROI changes given a specific scoring tile. Yes, by selling you reduce the price but in games with 3 and 4 players it is not unlikely that someone will buy the good you sold before you might have to sell that good again. Yes you need to buy merchants to sell more than 2 goods. On the other hand you do start with 2 merchants so one could argue that if you do not plan to buy for contracts, you should use these merchants to sell processed goods in the 2nd round. Also you do usually start with 3 goods and have 2 merchants only so you might want to build one processing building in the first round anyway so you do not have to buy a 3rd merchant in the first round. I don't think that worker or production units are clearly better than the other. It just depends on the setup, the contracts and how market prices evolve. If the market prices are just a bit higher than assumed, then the production strategy becomes a bit better and the worker strategy a bit worse and vice versa. If 3 players go worker heavy and one player goes production heavy, the latter has an advantage since market prices will most certainly be above average. I can imagine though that a worker heavy strategy is simpler to execute for new players since they have to juggle less with merchants and the market and can simply reinvest whereas the production heavy strategy requires careful consideration if you you should sell or export (but also opportunities!). 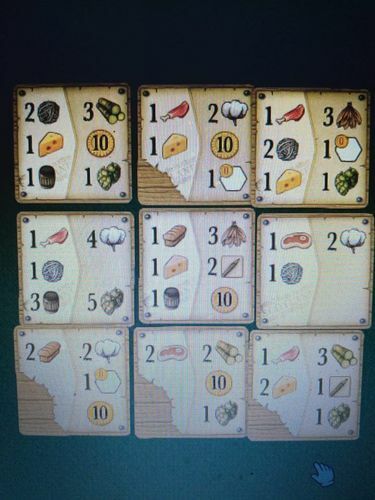 A production heavy strategy prefers fulfilling contracts early (so you do not have to buy as many merchants and decrease your goods' prices) and a worker heavy strategy prefers fulfilling contracts late game. Did you factor in anything apart from costs and income or am I missing sth. ?